A mikvah generally serves to restore a person to a state of ritual purity. For the most part, this is not relevant in post-Temple times when (a) we cannot become entirely pure and (b) there is little reason to become pure (read more about that here). Now, married women immerse in the mikvah as part of the laws of Family Purity, which are as relevant today as ever. The mikvah also serves as part of the process of converting to Judaism for both men and women. But how about men immersing regularly in a mikvah? There are two primary reasons why, even nowadays, many men immerse. The following reasons explain why many immerse on a daily basis, regardless of seminal emissions. What effect does the mikvah have on one’s ability to pray? Expounding on the verse “But a spring or a cistern, a gathering of water remains pure,”11 the Chassidic masters explain that when one immerses and is submerged in the mikvah, he is in effect submerged in a much higher state of purity. Once he leaves, however, he is no longer in that same state. This humbling process brings about the nullification of one’s ego. This is one of the reasons why someone who does not immerse on a daily basis may be particular to do so on a day when the Torah is read, or prior to Shabbat or holidays (immersing before Yom Kippur has other reasons as well). See Talmud, Berachot 22a, Bava Kama 82a-b; Rambam, Mishneh Torah, Hilchot Tefilah 4:4-5; Shulchan Aruch, Orech Chaim 88:1; Shulchan Aruch Harav, Orech Chaim 88:1. See Rif and Talmidei Rabeinu Yonah on Berachot, ch. 3. See previous citations, as well as Reishit Chachmah Shaar ha’Ahavah 11; Likutei Torah, Ki Tavo 43b. Mishneh Torah, Hilchot Tefilah 4:6. The Rambam actually uses the term “wash,” as he is referring to the Talmudic teaching that for the purposes of tevilat Ezra, if necessary one may pour 9 kab (tisha kabin, approx. 12-16 liters) of water on his body in an uninterrupted flow. A shower works for this purpose. To ascertain how many minutes are necessary, put a pail to catch the water under your shower head, turn on the water, and measure how long it takes for the water to reach the required measurements (this depends on the water pressure in the home). More advanced laws of of tisha kabin are beyond the scope of this article. Igrot of the Rambam (Shilat), p. 436, quoted in Talmidei Rabeinu Yonah on Talmud, Berachot 13b, and in the Ba’er Hetev on Shulchan Aruch, Orech Chaim 88:1. Igrot Kodesh, vol. 11, p. 400-1. Likkutei Torah, Parshat Ki Tavo 43b-c. Although he uses the word “mussar” and writes “especially Zohar,” see Toras Menachem 5713, Vol. 3, p. 17 and Toras Menachem 5720, vol. 1, p. 92 that this is accomplished through the teachings of Chassidism. In Mamarim Ketzorim, pp. 483-4, it only mentions Zohar. See Siddur im Dach, Kavanot haMikvah 159d. Torat Shalom, Simchat Torah 5673 p. 165; See also Lubavitcher Rebbe in Maamar Lefichach, Parshat Shemini 5716 (Torat Menachem vol. 16 p 248). See Likkutei Sichot, vol. 30, p. 19. See Igrot Kodesh, vol. 9, p. 253. See Keter Shem Tov 219. Why Is the Day After the Holiday Called Isru Chag? 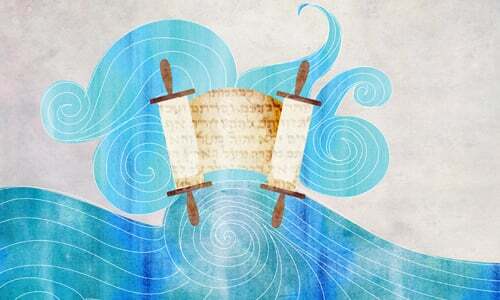 Why Is Passover Seven (or Eight) Days Long? Why Charoset on the Passover Seder Plate? Why Give Half-Shekels to Charity on Taanit Esther? "Playing on the Yiddish saying Men darf tunken zich in mikvah, “You need to dip yourself in the mikvah,” Rabbi Shalom Dov Ber of Lubavitch would say that one must immerse (and lose) his self (ego) in the mikvah.13"
That's a poor translation of the Yiddish saying which better translates to "One may (is allowed to) immerse one's self in (the) Mikva"- Rabbi Shalom Dov Ber's expansion on that is interesting & worth thinking about.